Home BLOG Project Management Blog Business Plan , How to Create a Business Plan ? What is a Business Plan, How to Create a Business Plan ? Business plan is one of the most critical documents for a new business. It describes the future of your business by explaining what you plan to do and how is your plan to succeed. A well created plan guides your business and key stakeholders during the execution or growing phase regarding to the dimentions and targets. It demonstrates your management, investors, lenders, or potential partners. From this aspect a successful start up or an expansion of business doesn’t come without a well created business plan. In this article we will discuss essential steps to write a business plan. Before to start a new business, most probably you have planned all the critical items in your head to make convert your small scaled enterprise into a big corporation. However, there will be many problems an issues along the road that have potential to obstruct your success. Best practice is to create a plan to face such problems before to make an investment. Simply put, a business plan is a strategic document which describes the current status of your business, your resources, targets, abilities and plans where you will be in the future and how you plan to get there. To put it all in simple terms, a business plan demonstrates how you will proceed from point A to point B in five to ten years. Although key aspects of this plan is easy to understand, you need to follow some basic stepts to create it. How to Create a Business Plan ? If you have never tried before, creating a business plan may look a bit complicated at the beginning. However, there are some basic steps that make it easier to write. As the name suggests, executive summary is a short summary section which explains what your business does, where your business currently stands, what is the plan for near future and how you will proceed. The main purpose of this section is to provide brief information regarding to the company, products and plans. It will be better for you to write this section once you have completed the whole plan by using the inputs of the following pages. Company Description is the second section of the plan which provides a quick description of your ownership structure and the explanation of your marketplace. In this section, explain your business and the industry of your company, provide a general overview. In the third section, you provide in depth analysis of your industry, market, and competitors. 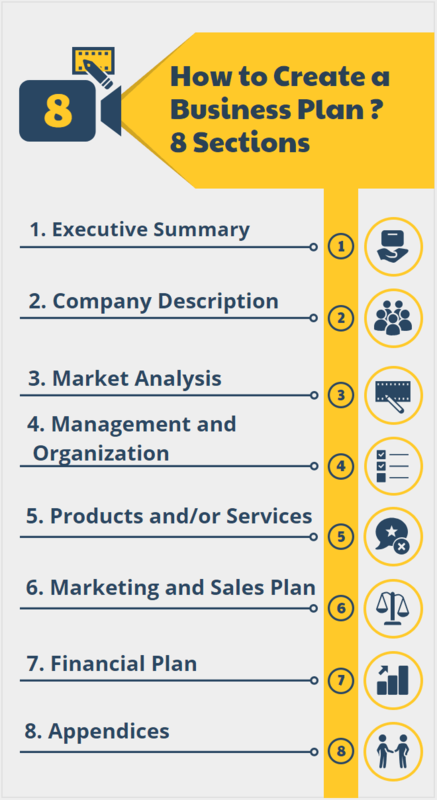 Unlike the first two steps, marketing plan is a comprehensive step which provides detailed information regarding to the market you are serving. Note that market analysis section should include detailed information and market overview. You need to make enough market research to understand the market characteristics and the potential competitors. You can check the SBA‘s guide for market research and competitive analysis at this stage. In this section, you describe your company’s management and organizational structure. You explain the current organization structure and personnel to be hired if needed. Also explain the background of your key personnel to demonstrate if you are capable of achieving the targets. Products and services is one of the most important sections of your business plan where you describe the current status of your products and future plans in detail. Give the deatils of your products and explain how they will fullfill the reqirements of the customers. If the product is still in the ideation phase or needs improvement, explain the steps for development, improvement and research. Finally describe the procurement system, vendors you need to create the product and give information about the inventory if you need. In this section you will explain how you’ll pull the customers attention and sell your products in the market. Explain the methods to reach customers such as by advertising or promotion. Also detail who will be selling the product. Financial plan section demonstrates your current financial status and involves projections for the future. If you don’t have any financial data of your business, provide just projections. Financial plan section should provide needed funding amount for the investors. Thus, they will understand how much they will support the business. This section provides supporting information such as charts, notes, reports and further researches. You may attach resumes and additional information corresponding to each section. Below tips may be helpful to write an effective business plan. In order to write a good plan, you should be aware of everything regarding to the product, market and customers. In general, potential lenders and investors don’t like to read long and complicated documents. It will be better for you to keep the document length at an optimum level. While creating the plan, keep in mind your potential audience and give provide them what they need. For example a lender may be more interested in financial projections rather than the technical features of the product. You need a business plan whether you start a new business or expanding your current business. Simply put it creates a roadmap explaining what you plan to do and how you plan to win through. In this article, we discuss the key aspects of a business plan. If you have ever created a business plan, you can share your experiences through the comments section below.